The endless attractions within the Acadia National Park are one of the main reasons why so many people choose to stay in Bar Harbor each year. Officially founded in 1919, the Acadia National Park is home to a wealth of local Maine flora and fauna, with a huge amount of wildlife often visible as you explore the endless hiking trails and 50 miles / 80 km of roads. 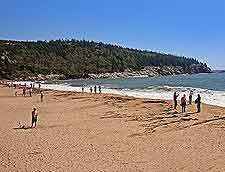 The Acadia National Park borders the land side of Bar Harbor, while Frenchman Bay edges the town's easterly shoreline. Tourists can expect to find some truly breathtaking scenery, with a wealth of outdoor sports and activities on offer all around the park itself. 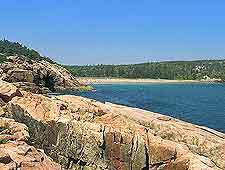 In total, the park covers an area of just over 60 square miles / 155 square kilometers, which actually makes up the majority of Mount Desert Island, together with areas of the Isle au Haut and the Schoodic Peninsula. 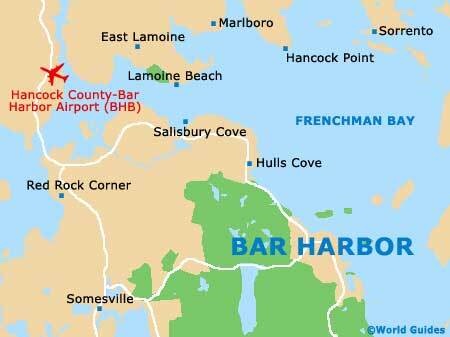 The main entrance to the Acadia National Park can be found directly to the northwest of Bar Harbor, at Hulls Cove and off the Highway US-3. Any exploration of the Acadia National Park should start at the Hulls Cove Visitors Center, followed by a drive along the Park Loop Road, which stretches for around 20 miles / 32 km and is a one-way road. Along the way, do make a stop at the Thunder Hole and watch the natural drama created by the crashing waves. 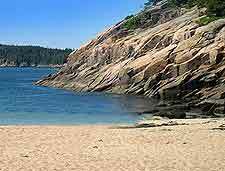 Nearby, the pink-granite Otter Cliffs are yet another sight that Bar Harbor tourists should look out for, being followed soon after by the Jordan Pond, a popular place to stop for lunch and enjoy a relatively short nature trail, which is self-guided. If it is a hot day when you are visiting Acadia National Park, then consider cooling off at either Echo lake, Seal Harbor or Sand Beach, although do bear in mind that the water is likely to be on the chilly side of cold. Finally, day trippers from Bar Harbor can finish the excursion with a drive to the very summit of the Cadillac Mountain, where on a clear day, the views are just incredible and quite endless.